Nutrition – Locum Tenens (Temporary) Dentist – Gregory Cole, D.D.S. Why is it So TOUGH to Make a Healthy Hot Dog? Well, you just cannot beat those nasty animal fats, according to this study. In part of an effort to replace animal fat in hot dogs, sausages, hamburgers and other foods with healthier fat, scientists are reporting an advance in solving the mystery of why hot dogs develop an unpleasant tough texture when vegetable oils pinch hit for animal fat. A report on their study appears in ACS’ Journal of Agricultural and Food Chemistry. Anna M. Herrero and colleagues explain that some brands of sausage (frankfurters) have been reformulated with olive oil-in-water emulsion as a source of more healthful fat. With consumers gobbling up tens of billions of hot dogs annually, and the typical frankfurter packing 80 percent of its calories from fat, hot dogs have become a prime candidate for reformulation. 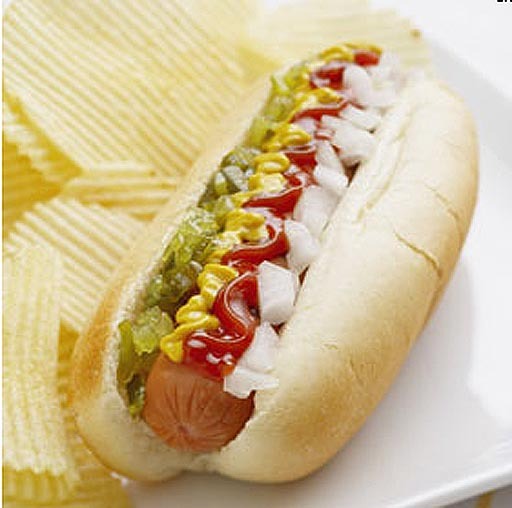 Some hot dogs reformulated with vegetable oil develop an unpleasant chewy texture. Herrero’s team set out to uncover the chemistry behind that change with an eye to guiding food companies to optimize low-fat sausage manufacture. Whatever…. a good hot dog is one of life’s pleasures and I will watch my fat intake in other ways – like avoiding potato chips and cheese. 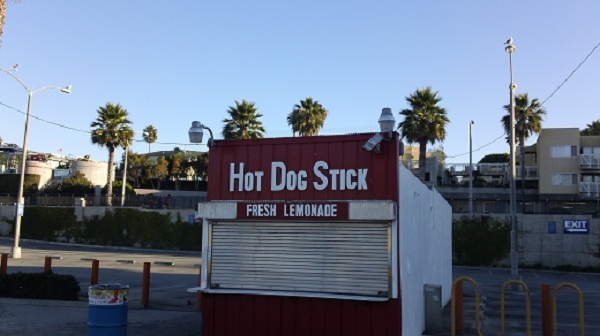 Although this next photo shows this Venice Beach, California stand closed, they do a very brisk business and I understand the Dogs are heavenly!